TM 1517 consists of a partial cranium, associated mandible, and several postcranial elements. 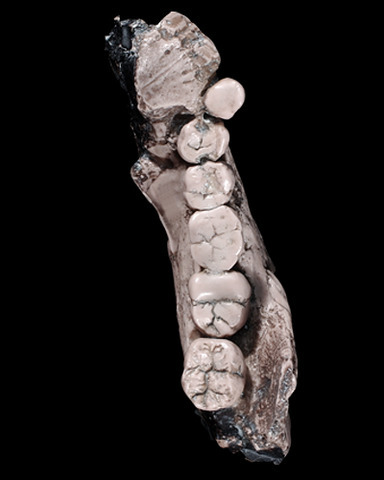 Compared to Australopithecus africanus, TM 1517 exhibits a large face, jaws and teeth. The molars and premolars in the mandible are much larger than those of gracile australopiths, and the size of the specimen’s sagittal crest and zygomatic arches indicates relatively robust chewing muscles3. The premolars have rounded crowns with well-developed and high cusps, which is similar to the modern human condition, but TM 1517's teeth are much larger1. The cranium is similar in size to that of the African apes, and Broom originally estimated its cranial capacity to be approximately 600 cc1. The palate is well-preserved, as is the left half of the sphenoid bone. The zygomatic arch is almost complete1. The palate is short and broad, and the incisors and canines are reduced1. The face is flatter and shorter than that of a gorilla1. Postcranial material is assigned to TM 1517 based largely on its close proximity to the skull at the time of excavation2. Broom R. 1938. The Pleistocene Anthropoid Apes of South Africa. Nature3591:377-379. Thackeray JF, de Ruiter DJ, Berger LR, and van der Merwe NJ. Hominid fossils from Kromdraai: a revised list of specimens discovered since 1938. Annals of the Transvaal Museum 38:43-56. Johanson D and Edgar B. 2006._ From Lucy to Language: Revised, Updated, and Expanded_. New York: Simon and Schuster.